Nothing beats interval training on the treadmill for improving performance while reducing the risk of injury associated with pounding out the miles on the road. Improve your running speed and anaerobic power with Coach Troy! 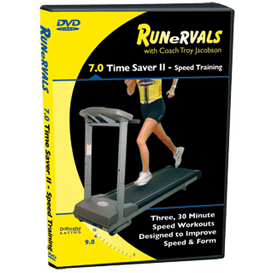 Runervals 7.0, Time Saver II - Speed Training, includes 3 highly effective 30 minute workouts designed to dramatically boost your leg turnover and leg speed. Whether you are training for the 5K or the Marathon, your program needs a high intensity component in order to fully maximize your potential. Due to the extreme intensity of these speed training sessions, you need to be very loose and warmed up. Now do some light jogging and stretching and get ready to train fast with Coach Troy!